Working efficiently is key to overcome the demands of scientific research. That’s why our scientists have developed a smarter, more efficient way to isolate cells. 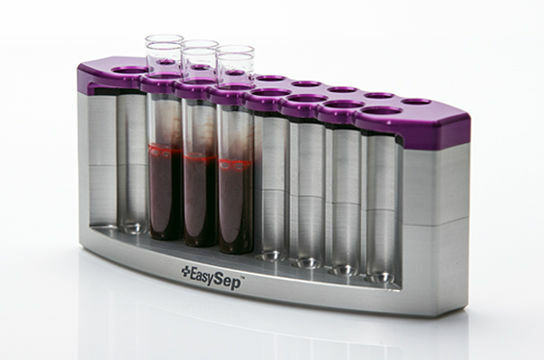 EasySep™ combines the specificity of monoclonal antibodies with the simplicity of a column-free magnetic system for fast and easy isolation of highly purified cells that are ready for downstream applications. This versatile immunomagnetic cell separation technology enables positive selection, negative selection, or cell depletion. 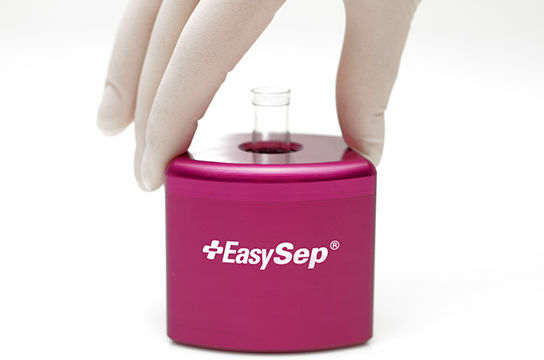 EasySep™ can be used to isolate cells in as little as 8 minutes from a variety of species (ex. human, mouse, non-human primate, rat, rabbit, cow and pig) and sample sources (ex. splenocytes, lymph nodes, PBMCs, whole blood, cord blood, bone marrow and leukapheresis samples). 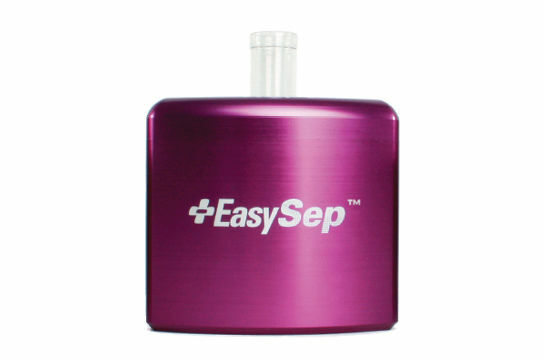 How Does EasySep™ Cell Separation Work? Cells are targeted for either removal (negative selection and depletion) or positive selection using antibody complexes directed to specific cell surface antigens. The antibody complexes link targeted cells to EasySep™ magnetic particles. 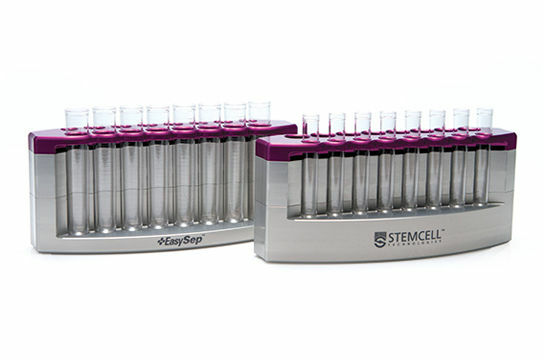 Labeled cells are pulled to the sides of the tube when the sample is placed in an EasySep™ cell separation magnet, while untouched cells can be simply poured or pipetted off into a new tube. Is EasySep™ a Well-Accepted Cell Separation Method? 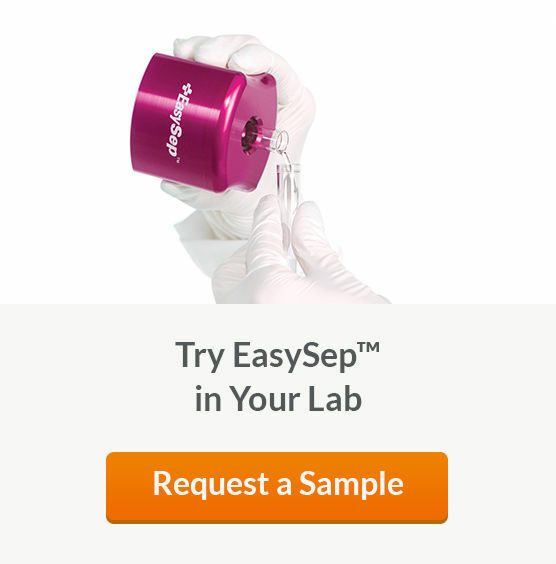 Since its launch in 2002, EasySep™ has been used by thousands of labs worldwide to quickly and easily isolate highly purified cells for a wide variety of applications. More immunologists are making the switch to EasySep™ so they can accomplish more with their time in the lab. 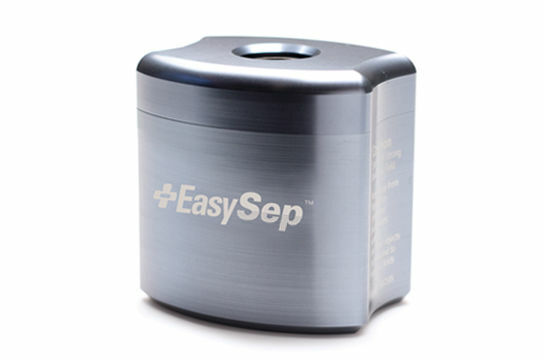 Why Use EasySep™ to Isolate Cells? FAST AND EASY. 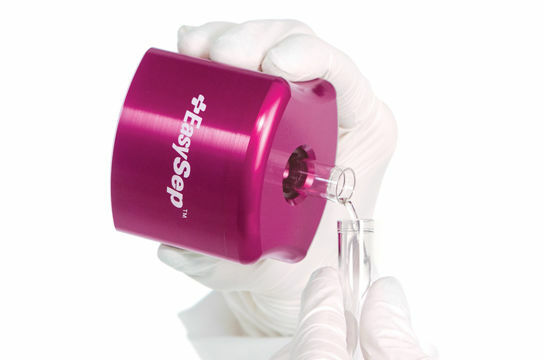 Isolate cells in as little as 8 minutes with a simple pour. HIGH PURITY. Achieve up to 99% cell purities with high recoveries. VERSATILE. Isolate cells from virtually any sample source, including whole blood and Leuko Paks. Already an EasySep™ user? Explore our next-generation EasySep™ kits and make sure your lab is using the most up-to-date kits. EasySep™ cell separation technology can also be used to isolate cells from a variety of other species, including non-human primate, rabbit, cow and pig. 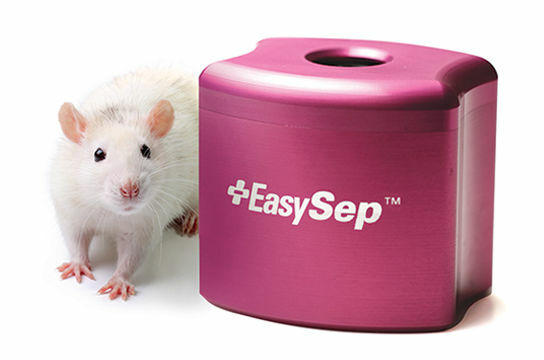 EasySep™ protocols are optimized for the efficient isolation of mouse cells with high purity and recovery. 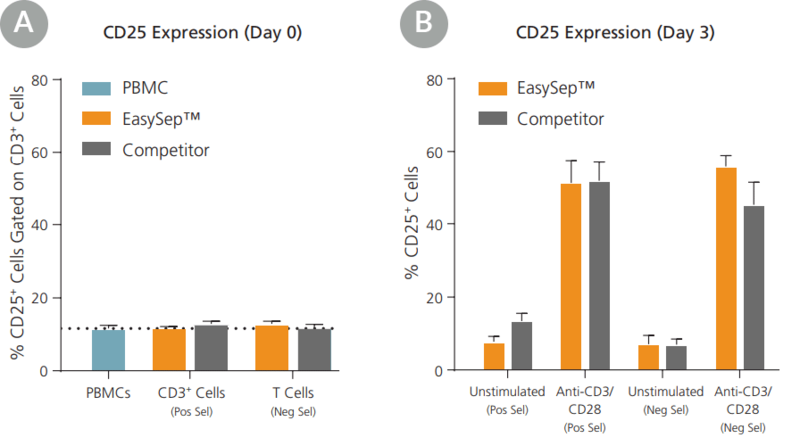 CD11b+ cells were isolated from mouse spleen by positive selection using EasySep™ or a competitor’s column-based kit. The competitor’s protocol was followed using their standard protocol or their optional “high purity” protocol, which recommended an additional column. 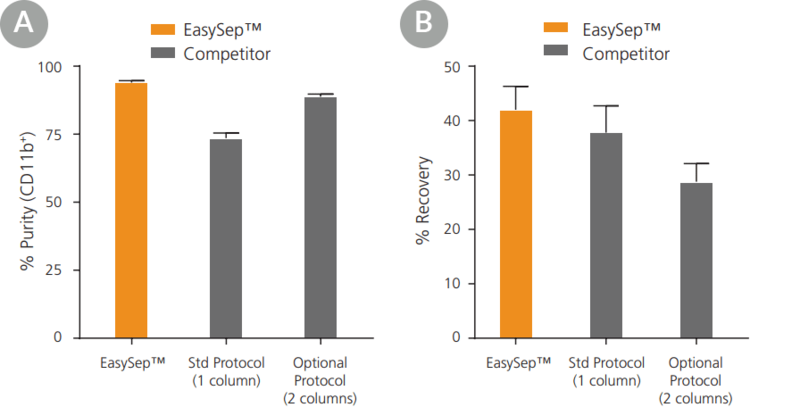 EasySep™ isolation yielded comparable or better purity (A) and recovery (B). Data shown as mean ± SEM; n = 4 - 6. Immune cells were isolated from processed leukapheresis or peripheral blood samples using EasySep™ positive selection or negative selection kits. Pre- and postisolation samples were stained with the cell viability dye 7-AAD and appropriate cell surface markers, and were assessed by flow cytometry. Cells isolated using EasySep™ showed no significant decrease in viability compared to the starting samples. Data shown as mean ± SEM; n = 3 - 7. 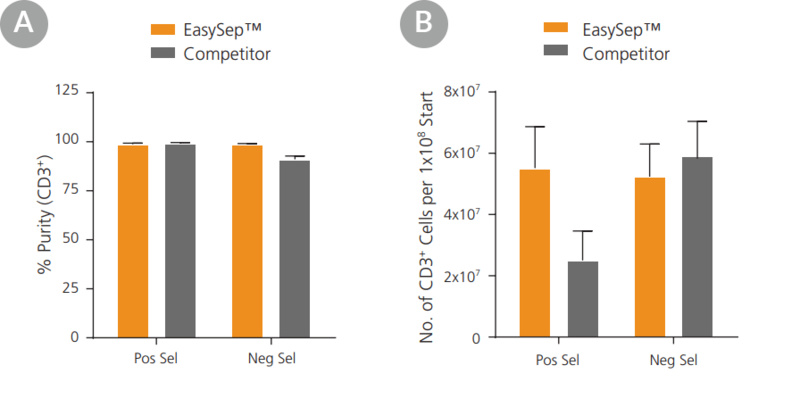 EasySep™-isolated cells express appropriate surface markers following differentiation and maturation. Human monocytes were isolated using EasySep™ or competitor products and then cultured and differentiated into mature dendritic cells (DCs). On Day 0, cells from a leukapheresis sample were plated and monocytes were adherence-selected for 2 hours. Non-adherent cells were washed away and adherent cells were cultured for 7 days. On Day 5, cells were cultured with maturation supplement for 2 days (mature DCs) or without maturation supplement (immature DCs). The expression of CD80, CD83, and CD86 in immature and mature DCs was determined by flow cytometry. At Day 7, cells expressed the mature DC markers CD80, CD83, and CD86.